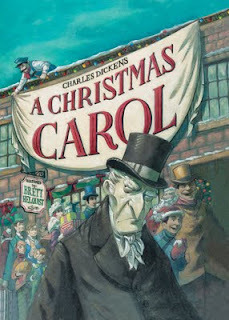 One of my favorite things about Christmas is Charles Dickens' novella "A Christmas Carol" and the countless artistic expressions it has produced. Not only does it give me an excuse to leave the window gels of ghosts up around the bathroom mirror-- "They're the ghosts of Christmas past," I tell my family and guests-- but the story masterfully blends the meaning of this season with a superb ghost story. Last night in Borders, I came across this picture book version of "A Christmas Carol." Brett Helquist is the illustrator, who is famous for his illustrations of the "Lemony Snickett" books. I did not buy a copy, but sorely want to, if only for the image of the Ghost of Christmas Yet to Come: the classic, faceless grim reaper, with old Christmas lights and dead wreaths robed about him. The illustration of the Ghost which most affected me, in the graveyard with Scrooge, is not on Helquist's blog, but a later piece of art with the ghost is. 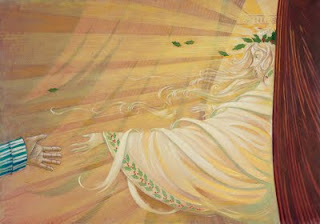 I find this piece depicting the ghost of Christmas Past to be particularly striking. The fading ghost of memory leaving; bright and fading, never able to be touched again. All images from Brett Helquist's blog.